Light Up The Night is an event on New Years Eve to highlight Suicide Awareness and the help that is out there. 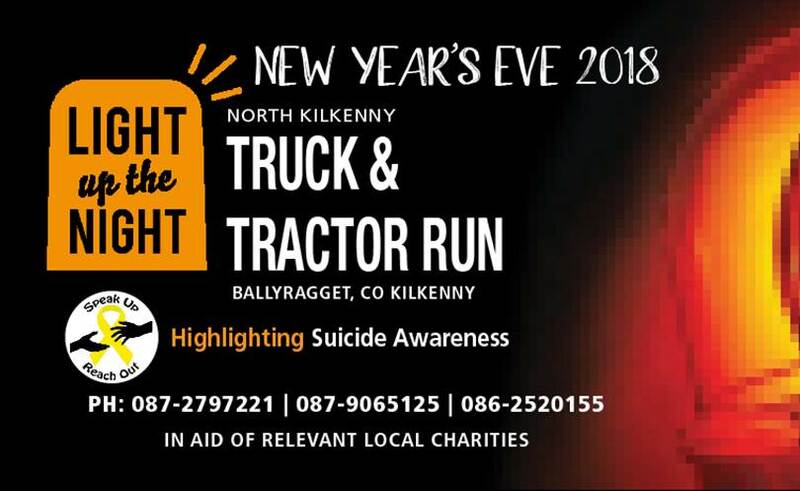 This is the third year of this event which sees the highways and byways of North Kilkenny lit up spectacularly by the lights and flashing beacons of hundreds Truck's and Tractors. In the past we have lit up the two highest points of North Kilkenny, Spa Hill Johnston and Ballymartin which are both in excess of 1,000ft with two convoys while also lighting up the outside perimeter of both Hill tops with a huge convoy of trucks which have lit up the motorway from Ballacolla to Urlingford. 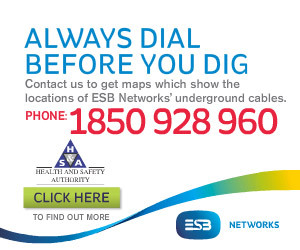 Fortunately for 2018 we have secured a concrete yard approximately 1km from Ballyragget town centre with ample parking for all trucks. Truck Registration and refreshments will take place on this site. Tractor parking, registration and refreshments will be as previous. REGISTRATION will take place between 1pm and 3.30 pm with refreshments served before a 4pm take off. Flashing lights are not mandatory but are encouraged as this is a night run. Hi vis are also encouraged for safety of all participants. Hoping to see you all there.